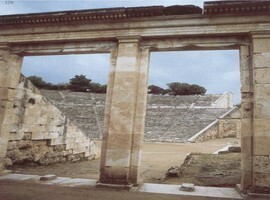 At The slope of Mount Kinortio, inside the boundaries of the place of worship, lies the most famous and best preserved ancient theater of Epidaurus, the miracle of Epidaurus, as it was called. It was built according to Pausanias, during the 4th century BC by the architect and sculptor from Argos, Polykleitos the Younger. Other scholars date it at the early 3rd century. However, if this is correct, the theatre cannot be regarded as a work of Polykleitos . 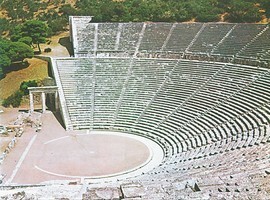 Having a circular orchestra a thymeli and 12 rows of 34 seats, it could accommodate up to 6,000 spectators. 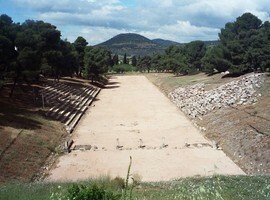 During the Hellenistic times the upper zone of the stadium was added, doubling the capacity of the theater. Today almost nothing survives from the scene with Ionic columns, but he famous acoustics still is of high quality. The sound reaches up to the highest tiers with clarity, thanks to the wonderful adaptation of the theater to the landscape (it’s built on the slope, which acts as a resonator). 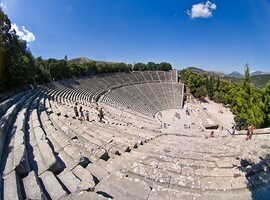 The theater, “a special sight” according to Pausanias, is being used every summer for performances of ancient drama and a temporary tent of lightweight materials is placed for the needs of each performance. 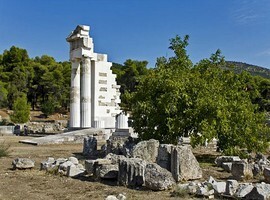 Built on a pine tree area, overlooking the ancient port of Epidaurus, lie the discovered ruins of the most important sanctuary of Asclepius, the god of health, which reached its acme in the late 5th and 4th centuries. 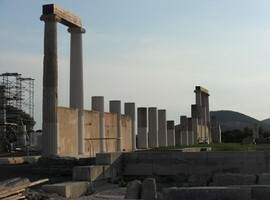 It was built by the architect Theodotus, probably between 380 and 375 BC. 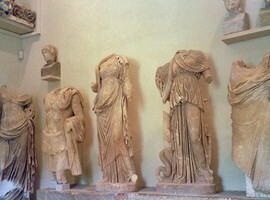 From the pavilion temple, with Doric columns, the brilliant gold and ivory statue of Asklepios mentioned by Pausanias and magnificent sculptures in the gables, today only the foundations are left, while parts of the sculptural decoration are kept in the museum. 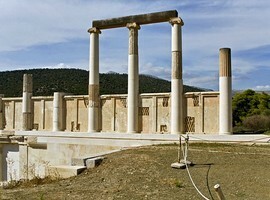 Within the nearby archaeological site, a short walkthrough will reveal numerous architectural monuments like the temple of Maleata Apollo of the fourth century BC, just behind the theater, where fans of the sanctuary of Asclepius had to offer their first sacrifice. 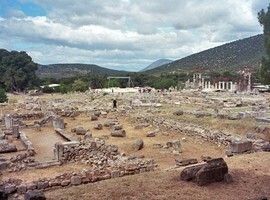 The Gymnasium looks like the arena of Ancient Olympia with its large courtyard and cloisters, where a small conservatory was built. 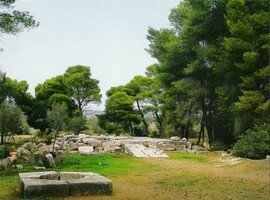 Nearby, there are ruins of the Kotya lodge as well as a small arena. Immediately after the arena you can see the temple itself, where you should look for the remains of the platform of the temple of Themis and the foundations of the temple of Godess Artemis. 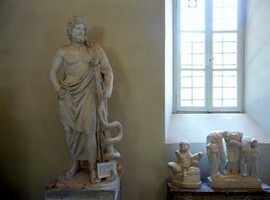 This place, also called Abaton or enkoimeterion, was a dormitory where the sick waited for the appearance of Asclepius. 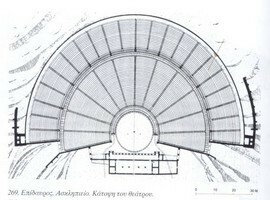 You should also be able to notice the dome, the “regional house” according to Pausanias and the splendid building of the sanctuary, a work of Polykleitos the Younger, a structure that has provoked much discussion about its destination. Nearby you can see ruins of complex buildings such as arcades, Roman baths, the remains of the Propylaea, which formed the imposing entrance to the sanctuary, and part of the fifth century stage. 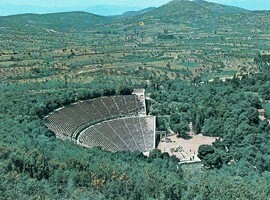 On the North West of the Acropolis of the ancient city of Epidaurus the small theater was built at an earlier period of sanctuary of Asclepius.It was mainly built for the events of Dionysian worship, so it was dedicated to the god Dionysus. 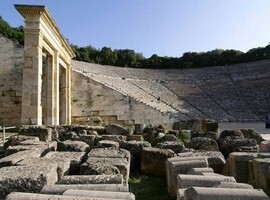 From the dedicatory inscriptions, we can assume that the construction of the theater took place during the 4th century sponsored by prominent nobles and elite people of society.